As the Full Moon rises, we can shine some light on exciting changes at Moon Gazer. OK, admittedly we have been teasing you with snippets of information and a few sneak previews of designs – but now here’s the full picture. 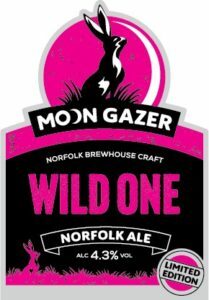 The name Moon Gazer has always seemed to captivate the beer lovers of Norfolk – and beyond – far more than we could ever have imagined. Indeed, Moon Gazer has become the bar call of choice, rather than ‘a pint of Norfolk Brewhouse’ please. 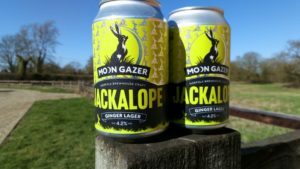 So, the first change that you will notice is that the Moon Gazer name will come to the fore and also that all of our beers will now proudly carry the name of a hare – reflecting the ‘personality’ of that particular beer. Since our home county of Norfolk is so important to us you won’t be surprised to see the words ‘Norfolk Brewhouse Craft’ on every bottle and every pump clip. It is important to us that we promote our proud association with this fine county which – after all – provides us with the very finest Maris Otter malt! So, what else can you expect as we embark on the next stage of our journey…? We’ve a fresh new look. Our Moon Gazing hare still sits proud and resplendent in front of the moon, but he’s brighter and a lot more colourful. Time to meet our new family of hares. Gone are our original names such as Golden, Amber and Ruby and in come Jigfoot, Jumper and Nibbler – and that’s just for starters. These new names – and new personalities – are all taken from a 13th century poem which first brought together some 77 names of this majestic creature. The names were local favourites from across the country, born out of centuries of folklore and history. Indeed, it is this same poem which gave our two Norfolk lagers their names. DewHopper and StubbleStag have been firm favourites since we first started brewing, so we know that you will take to, and love, our new family of ales. So, whether it’s a cheeky pint of Pintail, a swift half of White Face, or a warming drop of Bouchart you’ll be in good company with our classic core range of Moon Gazer ales. You can check them all out on Our Ales pages. We already regularly bring you new beers, but now every Full Moon will bring a new limited-edition Moon Gazer. Crafted to appeal to all tastes, and occasionally pushing the boundaries a wee bit – you know how we like a play – these ales will include regular collaborations with other brewers or artisan producers. Starting you off is Wild One. Named after the wild mysterious hare which has captivated the imagination for centuries, this new beer is an easy drinking amber ale – fresh fruity and well balanced. Look out also for Ostara our new spring ale named after the Goddess of spring who had a hare as her companion. You can (no pun intended) also discover our new Jackalope. This ginger lager is named after a mythical creature – part hare, part antelope. We’re sure it’s going to be a sunshine smash this summer and will be available in 330ml cans. You can read the full story here. We hope that you like the new look, the new names and the new beers. If you are visiting pubs you will be able to enjoy ordering a new look pint as of today. It may take a few weeks while all of the bottles get the new look but they too will be popping up in your local shop over the next few weeks. So, please do remember that it’s time to Stop Staring and Start Gazing.